America at Work, America at Leisure: Motion Pictures from 1894-1915 - Work, school, and leisure activities in the United States from 1894 to 1915 are featured in this presentation of 150 motion pictures, 88 of which are digitized for the first time (62 are also available in other American Memory presentations). Highlights include films of the United States Postal Service from 1903, cattle breeding, fire fighters, ice manufacturing, logging, calisthenic and gymnastic exercises in schools, amusement parks, boxing, expositions, football, parades, swimming, and other sporting events. American Labor Museum - Haledon, New Jersey. Visit the permanent exhibit "1913 Paterson Silk Strike," featuring historic photographs of workplace conditions, wage scales, picketlines, strikers' meetings at the Bottos' home, and the organizers of the Industrial Workers of the World (IWW). View temporary, changing exhibits on an array of topics related to workplaces, workers and organized labor, past and present. American Labor Studies Center - Includes links to the histories of international unions. Archives - University of Colorado, Boulder Libraries. Bertrand Russell Archives - McMaster University (Ontario, Canada). Bridgeport Connecticut Public Library - Oral histories. California State University, Long Beach - Virtual Oral/Aural History Archive. California State University, Northridge - Urban Archives Center. Catherwood Library - Cornell University. Catholic University - Includes records of the Congress of Industrial Organizations (CIO). Center for Labor Education and Research - University of Hawaii, West Oahu. Centre for Industrial Relations and human Resources Library - University of Toronto (Ontario, Canada). Chicago Historical Society - Haymarket Affair Digital Collection. Debs Collection, Cunningham Memorial Library - A collection of letters, articles, speeches, pamphlets, scrapbooks, newspaper clippings, photographs, periodicals, and other items. Digital Commons@ILR - Highlights the scholarship of the faculty and researchers at the School of Industrial and Labor Relations (ILR) at Cornell University's by making available their working papers, reports, conference presentations, journal articles, dissertations and theses, etc. In addition to the intellectual work of ILR faculty, DigitalCommons@ILR also houses collections of digital material selected by the reference librarians and archivists at Catherwood. These collections were created out of a growing concern over the loss of born digital materials and grey literature and the desire to ensure access to these resources for current and future students, faculty, and researchers. East Tennessee State University - Archives of Appalachia. The Contenders: They RAN & LOST but CHANGED Political History - Broadcast live by C-SPAN from the Debs Home on 30 Sep 2011. Gonzaga University: Foley Center Library - Includes Jay Fox (anarchist and labor radical) papers. Greater New Haven Labor History Association (GNHLHA) - Collects, preserves, and shares the history of working people in the Greater New Haven Area in Connecticut. Guide to the Paul F. Brissenden Collection of Research Materials On Labor Injunctions In New York State, 1898-1940 [bulk 1928-1936] - The largest part of the collection consists of six hundred and twenty case files, organized by case name, reproduced from New York State county clerk records and those of participating attorneys. Cases fall into four general categories: 1) employer vs. union; 2) union vs. employer; 3) interunion; 4) non-labor. Case files typically include trial transcripts, appeals, legal documents, notes, clippings, correspondence, and supporting documents such as responses of attorneys to questionnaires on economics, procedure and practice. 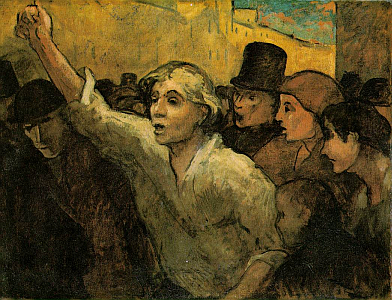 Examples of acts frequently restrained include picketing, labor violence, boycotts, strikes, use of scabs, refusal to submit to labor dispute settlement by an impartial chairman, layoffs, unfair labor practices, use of individual contracts and yellow dog contracts. Hapgood Mss. - The papers of Powers Hapgood, 1899-1949, labor leader. Harry Bridges Project - Los Angeles, CA. Holt Labor Library - San Francisco, CA. Illinois Labor History Society - Chicago, IL. Indiana State University at Terre Haute - Eugene V. Debs Collection. Indiana University; Bloomington - Labor and left-wing collections. Indiana University of Pennsylvania - Labor and industrial history. Industrial Relations Library - Princeton University. Institute for Research on Labor and Employment, University of California, Berkeley - An "Organized Research Unit" of the University of California at Berkeley. IRLE was founded in 1945. IRLE sponsors numerous community service programs, including the California Public Employee Relations, Center for Labor Research and Education, and the Labor Project for Working Families. It publishes the widely respected academic journal, Industrial Relations: A Journal of Economy and Society, and houses an important research library that collects and preserves a wide array of information about work, organizations and labor issues. Institute of Labor & Industrial Relations - University of Illinois at Urbana-Champaign, IL. International Association of Labour Institutions (IALHI) - Brings together archives, libraries, document centres, museums and research institutions specializing in the history and theory of the labour movement from all over the world. International Institute of Social History - Amsterdam, The Netherlands. One of the world's largest documentary and research institutions in the field of social history in general and the history of the labour movement in particular. IPO: A Global Guide - Blog provided by Philippe Espinasse to report notable events on international IPOs. Kheel Center for Labor-Management Documentation and Archives, Cornell University - Preserving original source materials relevant to the history of American labor unions, management theory as it applies to labor and industrial relations, and the history of employees at the workplace. Labadie Collection, University of Michigan - Anarchist & other social movement materials. Labor Archives in the United States and Canada - A directory. Labor and Industrial History, Manuscript Collection - Indiana University of Pennsylvania. Labor and Industrial Relations Library - Michigan State University. Labor and Working Class History Association (LAWCHA) - Open to everyone interested in studying the history of working-class men and women, their lives, workplaces, communities, organizations, cultures, political activities, and societal contexts. Promotes an international, theoretically informed, comparative, interdisciplinary, cross-cultural, and diverse labor and working-class history. Labor Arts - A virtual museum gathering, identifying and displaying images of the cultural artifacts of working people and their organization. Labor Heritage Foundation - Works to preserve and promote knowledge of the cultural heritage of the American worker through the arts, including music, poetry, written works, theatre, and artistic works; and conducts historical research through written and oral histories. Labor History Sources - Manuscript Division of the Library of Congress. Labor Relations and Research Center - University of Massachusetts, Amherst. Labor-Related Films - Library of Congress Collection. Lilly Library: Labor and 'Left-Wing'-Related Collections - This page provides the collection name, date range and number of items in a collection followed by a very brief description of the contents of the collection. All of these collections are related to labor or 'left-wing' issues. National Labor College - Silver Spring, MD. Niebyl-Proctor Marxist Library - Oakland, CA. Pacific Northwest Labor and Civil Rights Projects - The gateway to a set of labor and civil rights history projects directed by Professor James N. Gregory at the University of Washington and supported by the Harry Bridges Center for Labor Studies, the Simpson Center for the Humanities, and the Center for the Study of Pacific Northwest. These eleven projects bring together nearly one hundred video oral history interviews and several thousand photographs, documents, and digitized newspaper articles. Included are films, slide shows, and lesson plans for teachers. The projects also feature dozens of historical essays about important issues, events, and people, many written by undergraduate and graduate students at the University of Washington. Penn State University Historical Collections and Labor Archives - Official repository for the United Steel Workers of America. Reference Center for Marxist Studies - New York, NY. Remember the Triangle Fire Coalition - Created to bring together a broad and diverse group of organizations and individuals to commemorate the centennial of the Triangle Factory fire on March 25, 2011. Now the Coalition is leading the effort to continue the commemoration of the Triangle fire by installing a permanent public art memorial and continuing the tradition of annual commemorations of the fire. Remembering Triangle Factory Fire - This web exhibit presents original documents and secondary sources on the Triangle Fire, held by the Cornell University Library. You will find original documents, oral histories, and photographs. You can hear and read first-hand accounts by survivors and others that will provide a glimpse into the lives of workers and a sense of the horrors of a factory fire that claimed the lives of 146 young workers. A selected bibliography of sources on sweatshops and the Triangle Fire includes sources for teachers of history. Not posted on the site is a partial but extensive transcript of the trial, and documents on subsequent commemorations of the fire. Reuther, Walter P. Library - Home to the Archives of Labor and Urban Affairs and the Wayne State University Archives. It collects, preserves and provides access to the heritage of the American labor movement and related reform movements of the twentieth century. The collection also includes urban affairs, with particular focus on the history of metropolitan Detroit. Robert F. Wagner Labor Archives - A unique, internationally-known center for scholarly research on Labor and the Left. Its primary focus is the complex relationship between trade unionism and progressive politics and how this evolved over time. Archival, print, photograph, film, and oral history collections describe the history of the labor movement and how it related to the broader struggle for economic, social, and political change. School of Management & Labor Relations Library - State University of New Jersey Rutgers. Southern Labor Archives, Pullern Library - Georgia State University. The largest accumulation of labor records in the Southeast, the Archives holdings include organizational records, pamphlets, periodicals, photographs, personal papers of labor leaders, oral histories, collective bargaining agreements, constitutions and bylaws, and convention proceedings from 1888 to the present. Tamiment Institute Library and Robert F. Wagner Labor Archives - New York University. Texas Archives of Autonomist Marxism - University of Texas. Trotskyana.net - Focuses on issues related to Trotsky, Trotskyism and Trotskyists. U.S. Labor and Industrial History WWW Audio Archive - University at Albany, State Univ. of New York (SUNY). University of Texas at Arlington - Official depository of the Texas AFL-CIO. Wirtz Labor Library - U.S. Department of Labor Library, Washington, D.C. Working Class Movement Library (WCML) - A collection of English language books, periodicals, pamphlets, archives and artefacts, concerned with the activities, expression and enquiries of the labour movement, its allies and its enemies, since the late 1700s. Youngstown Historical Center Archives/Library - Youngstown, Ohio. This webpage last updated on Monday, January 21, 2019 1:27 PM.